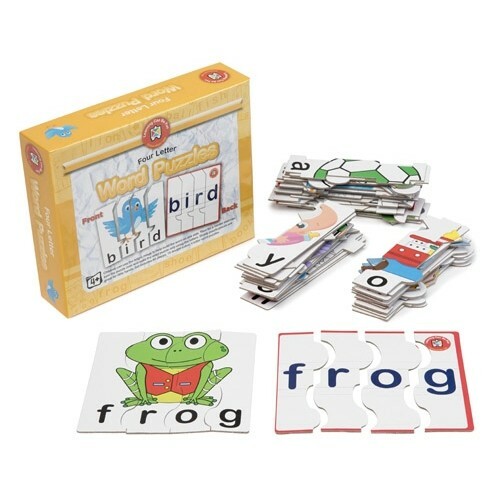 These simple puzzles have been designed for young children to introduce basic four letter words using a picture puzzle. When each puzzle is complete, help the child to read the word shown. Children can use the bright image to help build the word on one side. Then for a harder exercise, turn the puzzle over and build the word puzzle only using the letters. Sturdy puzzle pieces are great for little hands. Each puzzle measures 13cm x 13cm. Contents include: 65 pieces, 15 double-sided, four letter word puzzles. Educational value: Develop matching skills, visual and word recognition.